ANNOUNCEMENT: May 1, 2019, Budget Workshop Cancelled. May 1, 2019, Budget Workshop Cancelled. The Budget Workshop scheduled for May 1, 2019, is cancelled. Budget discussion will take place on May 6, 2019, as part of the Board Curriculum Committee Meeting. The Board Curriculum Committee will start immediately following the 6 pm Board Facilities Meeting on May 6, 2019. The meetings on May 6 will be held at the Education Center in the Edgeboro Room. 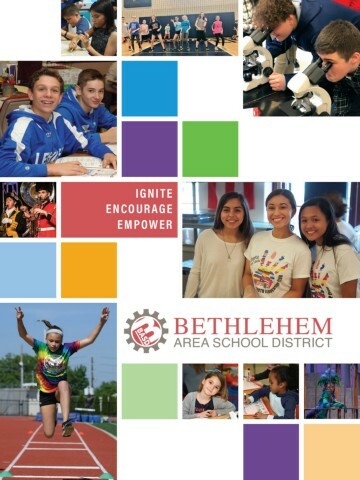 The Bethlehem Area School district noted in their 2018-2019 printed calendar that all schools in the district would be closed for the Primary Elections in May. The PA State Office of Elections has confirmed that Primary Elections will be held on May 21, 2019. Therefore, all schools in the Bethlehem Area School District will be closed on May 21, 2019. Our MissionThe Bethlehem Area School District, in partnership with the home and community, is committed to providing a safe and supportive environment in which each student will attain the knowledge, skills, and attitudes necessary to become a productive citizen and life-long learner in our technologically demanding and culturally diverse society. of each of our elementary schools. To place an ADVERTISEMENT in the BASD District Calendar, please contact the Office of the Superintendent at 610-861-0500. Learn more about the PLTW engineering program at BASD. BASD Superintendent's Full Tuition Scholarship to Moravian College. Enhancing the learning opportunities for all students of the BASD. The BASD accepts real estate taxes paid online. Bid specifications for public review. © Bethlehem Area School District 2014 Comments or Suggestions?